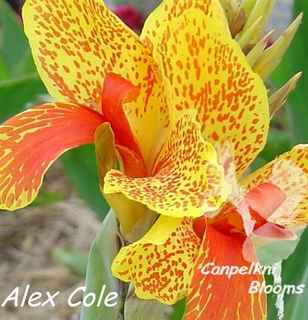 Stunning canna Alex Cole is a distinctive cultivator with variegated yellow flowers that are spotted with a scarlet red color. The labellum on Alex Cole is always heavily striped with red blotches so much that they often form small blocks of color. 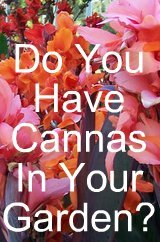 This cannas flowers change and show different formation in color throughout the season. The only consistency with this cultivator is the labellum and stamen always shows heavy red; the petals which are really modified staminodes vary with the season. 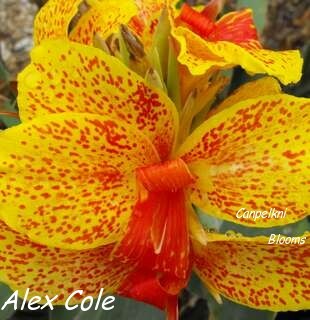 Alex Cole is a medium growing canna that reaches 1.2 meters tall when in flower and it also sets seed. The foliage on this canna is green with a clear colored margin on the leafs edges. 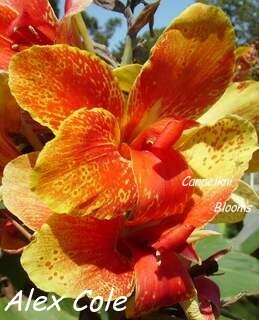 This heritage canna is one of a few garden plants raised in Australia by Charles F Cole. A good lasting flower garden plant that blends in perfectly with other cottage garden flowers.